Material: 98% cotton, 2% spandex, soft and lightweight. 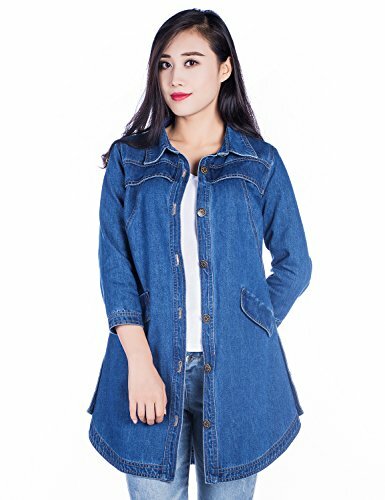 Classic women casual long loose denim jacket for spring summer autumn daily wear. Fashion, Three quarter sleeve, Turn down collar, Single-breasted. 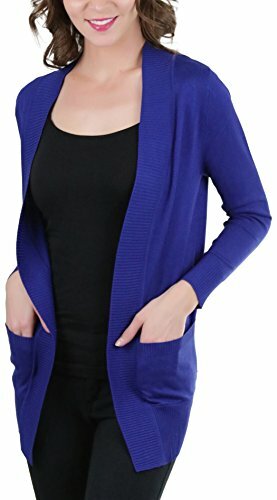 Classic three quarter sleeve, Open front, No closures, Cropped fit cardigan with ribbed streamline with a super comfortable fit. Hits at waist. Enhanced with a spandex and cotton blend, they feel unbelievably soft and fit perfectly. 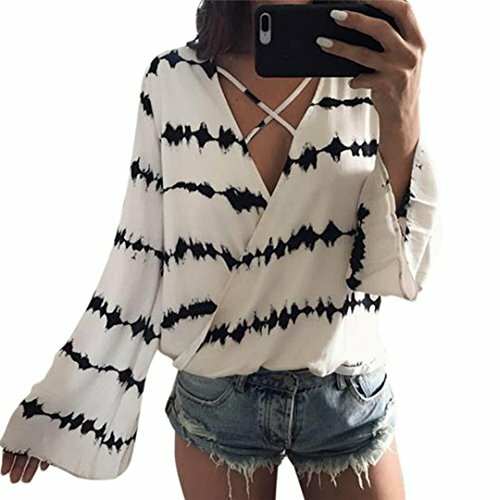 Criss Cross Cold should Round-Neck design tunic sweatshirt.Perfect fit for Casual, Party, Work, Date, Wedding, Cocktail, Nightclub and Homecoming occasions. 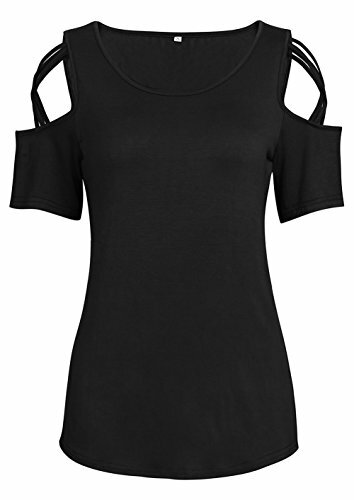 95%polyester+5%spandex.Lightweight soft fabric for a comfortable feminine touch. Hand wash in cold water, Do not bleach, Line dry. 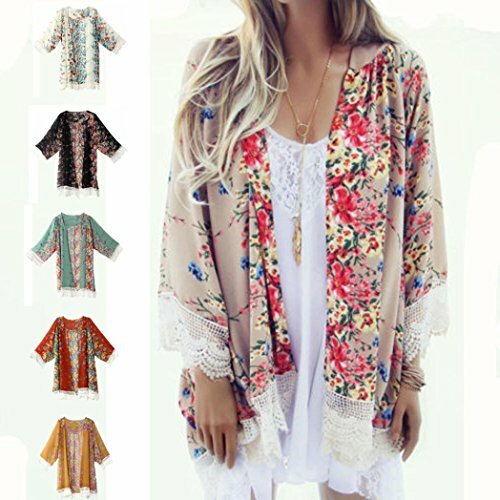 Chiffon Jacket,Floral Printed cardigan, Long Sleeve cardigan. 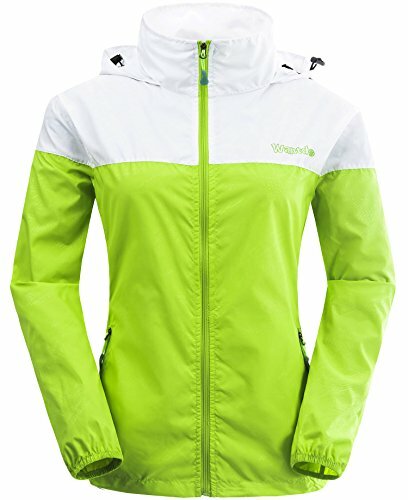 Super soft,comfortable and lightweight. 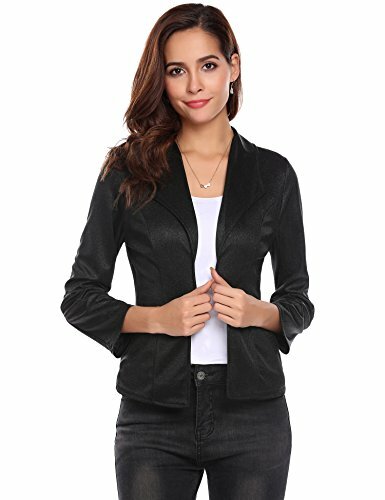 Women coat tops outwear cardigan. Open Front Closure,Rounded Neckline, No Lining. 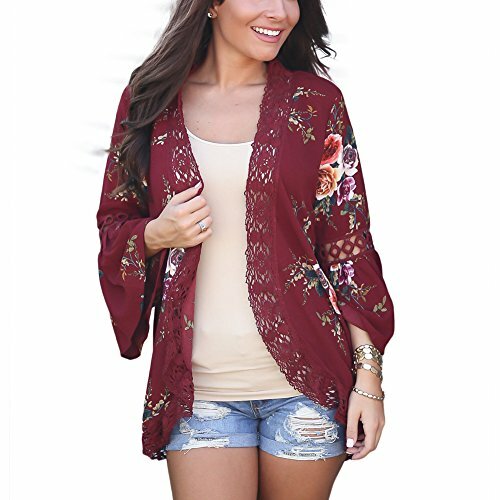 Floral Tunics Top Blouse. 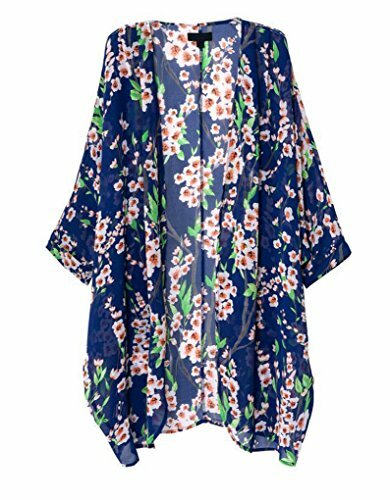 Stylish and Casual loose design perfect for beach, resorts, pool, holiday,cruising party and daily wear.Fashion capes for Spring,Summer,Autumn. Good partner for Bikini,T-shirt and shorts,Mini dress and so on. Features: Round Neck, Sleeveless, A-line, Lace Splicing Hem, Side Pockets, Above Knee Length, Plus Size, Loose Fit. 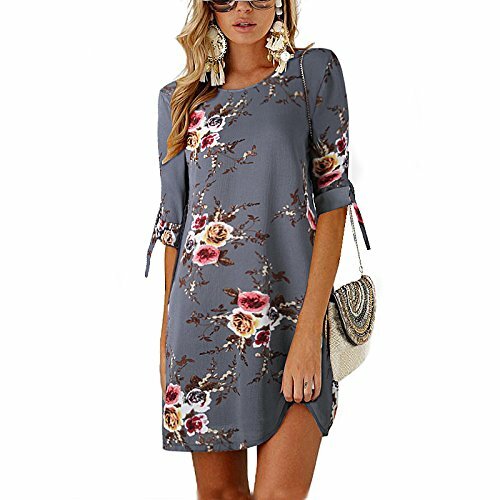 Summer Casual dress,flowy dress,swing dress,sundresses,two handy side pockets you’ll love.Can be easily dress up or dress down. 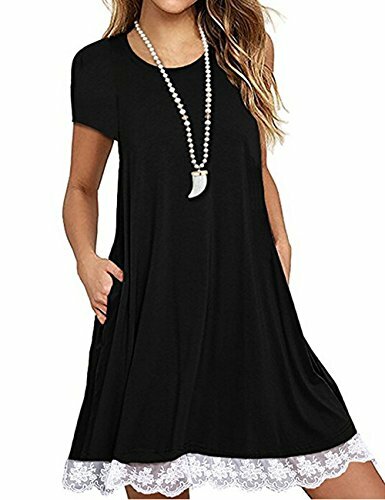 Basic Plain T-shirt Dresses,suitable for women, juniors, ladies, teen girls daily casual,travel,beach,party,club or home around. ✿【Material 】: Imitation Cotton Lycra,Made from high quality fabric, lightweight soft and comfortable. 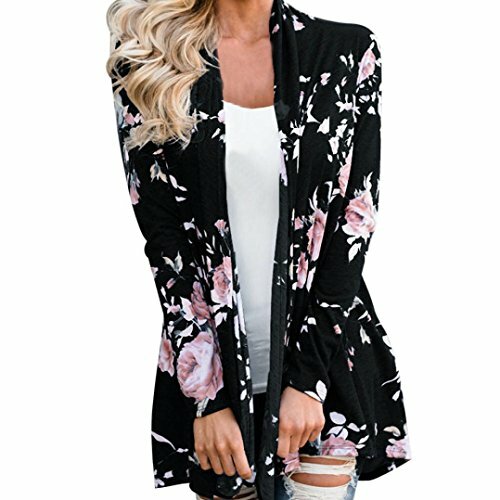 ✿【Design】:Women Cardigan，Ladies Floral Jacket Open Front Kimono Overcoat Casual Cardigans;Stylish and fashion design make you more attractive. 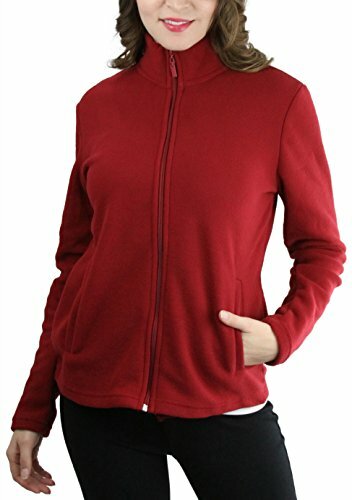 Made of high-quality material, mild to women’s skin, soft and comfortable to wear and touch. 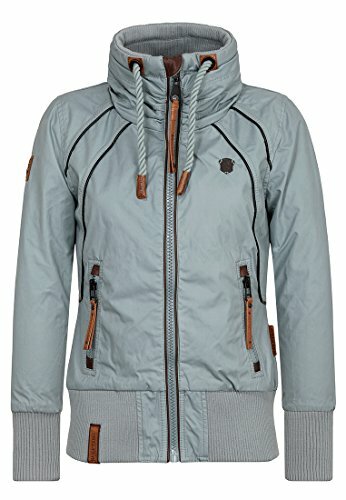 Good choice for outdoor, club, date, shopping, casual wear in daily basic in summer and fall. 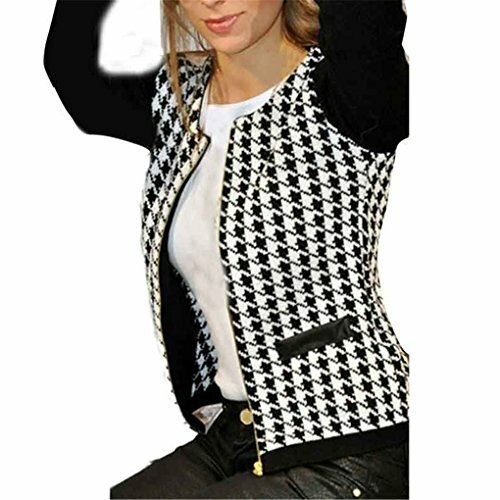 Occasion: Casual, Going out, Business attires, Formal ,Work, Outdoor ect. 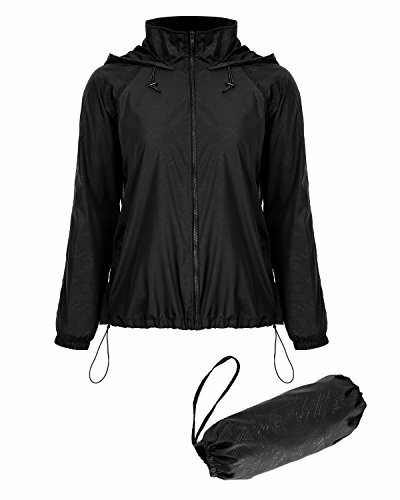 Unlined Style: Thin material and little see-through, It is light enough to wear on cool autumn or spring days. 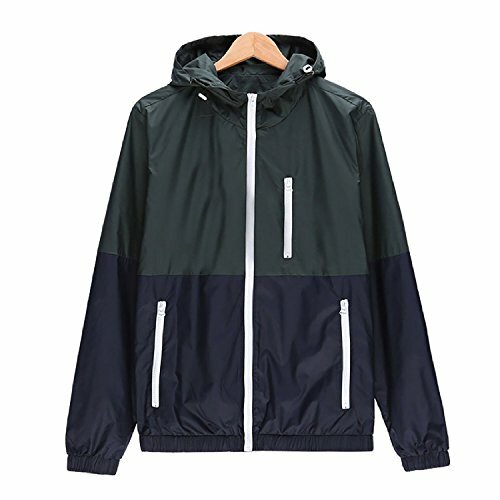 With Lining Style: Fully Lined,Lightweught but keep you warm. 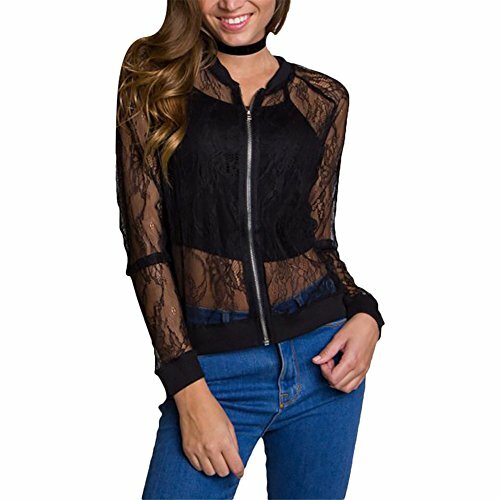 ✔✔✔Special offers and product promotions(On the middle of listing)Can Save 10% on this item when you purchase 1 or more item offered by Anienaya. 100% nylon material. It has the function of sunscreen. It is necessary to travel in summer. The design of hat, can protect the child’s every inch of the skin, simple and not monotonous. 95% Polyester, 5% Spandex. Soft and breathable. 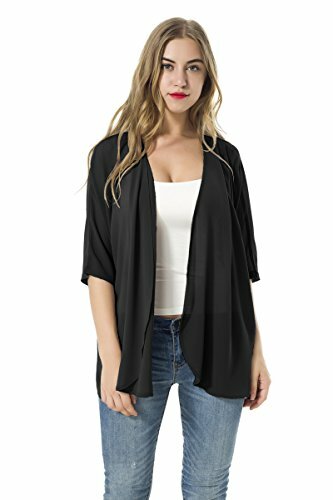 Long Sleeve, Lapel, Solid, Open front short cardigan with pockets. Garment Care: Machine wash max 40°C, Hang to dry, Iron with press cloth. 100% Polyester,very soft,breatheable and comfortable. Garment Care: Hand-wash and Machine washable, Dry Clean . 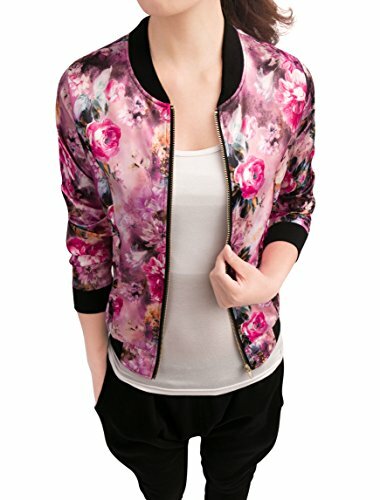 Features:Floral Printed,Zip Up,Baseball Short Jacket,Long Sleeve,Ribbed Trims and Cuffs,Satin,Front Pocket,Round Neck,Snap Front Closure. Vintage print tunic swing dress, designed with beautiful multicolor flower patterns, perfect to wear alone as a little chic dress, or wear with a jacket / cardigan outside. 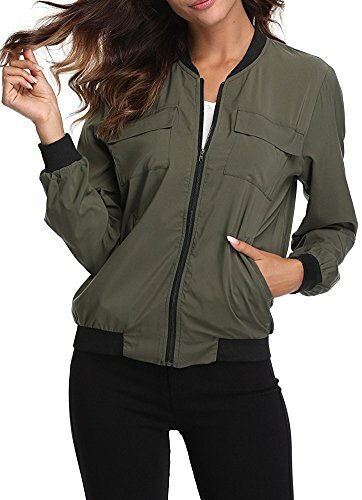 Breathable Material – The bomber jacket is made of polyester,the colored neckline,sleeve cuff and lower hem are made of cotton.Lightweight,soft and comfortable. 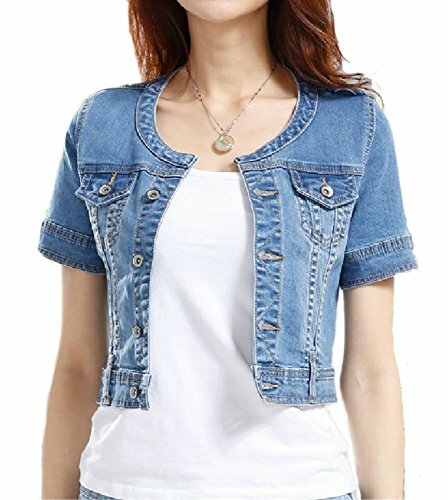 One Size – Length: 24.5in,Bust: 45.8in,Shoulder width: 20.6in,Sleeve length: 19.8in.Please be sure to definitely measure yourself according to the size chart WE OFFER (Not the Amazon Size). 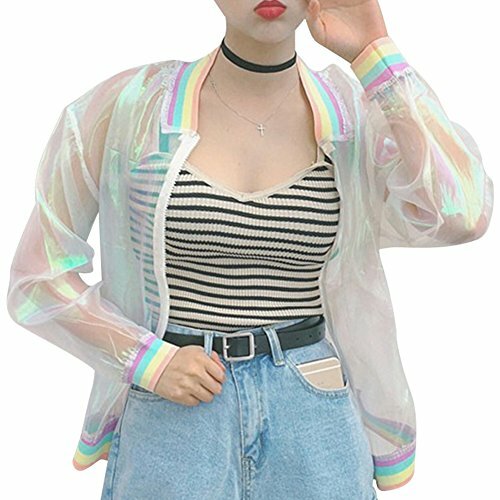 Novel Style – Harajuku rainbow laser jacket,the colors vary with light change,super shiny especially in sunlight.Wearing this jacket will instantly make you be the focus of the crowd. 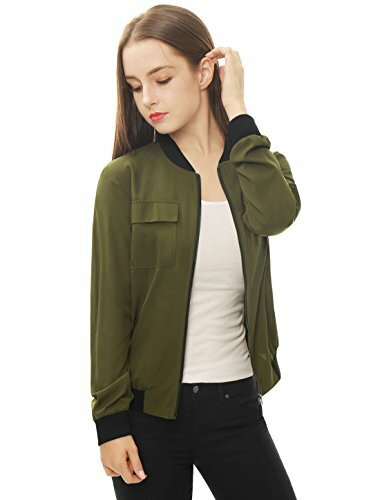 Keep your casual look so cute and chic with this must-have bomber jacket. Great for Spring, Summer or Fall. 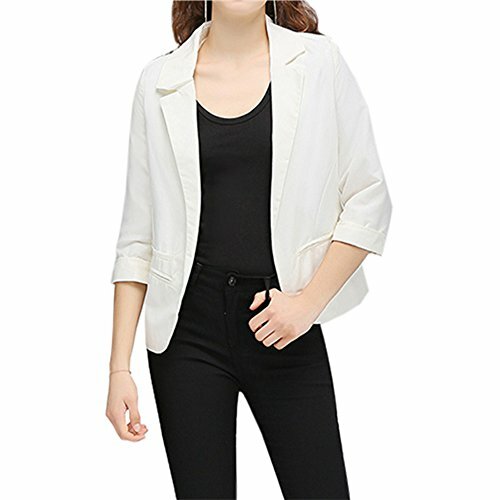 This fashionable cardigan is the perfect accessory. Ribbed Cuff Long Sleeves. Ribbed Band. Open Front Style. Two Side Pockets. Classic Fit. Pull On Closure. 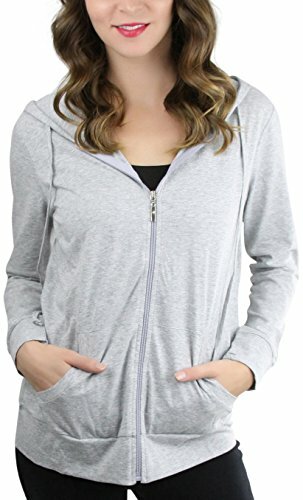 Made in soft, quality cotton, this casual style zip-up hoodie is perfect for when you want extra protection without having a bulky jacket on or to keep up with your active lifestyle. Comfortable, flattering, and functional. Long Cuffed Sleeves. Kangaroo Pocket. Zip Up Closure. Thin Fabric. It’s perfect for when you need to get things done. (=^ ^=) Please check the size chart carefully before purchasing. This blouse is1-2 size smaller than US size. 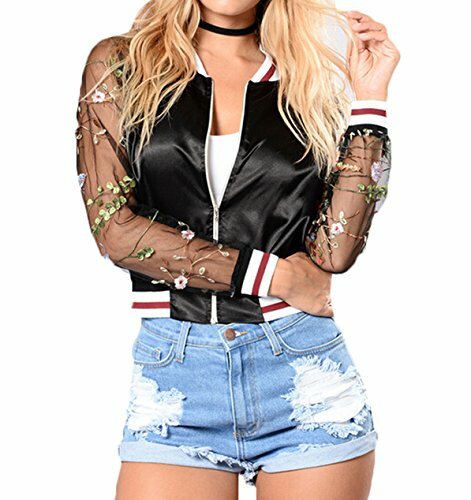 (=^ ^=) Perfect Match with your favorite shorts,leggings, black slacks, denim jeans, etc Adjustable drawstring waist belt, give more space in the waist part and for a flattering fit in winter. 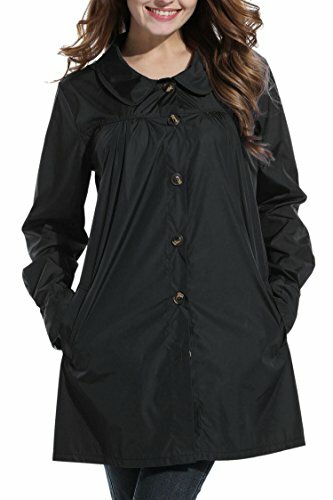 (=^ ^=) Fahion and stylish design,comfortable material and you can’t beat the price!